When Dieudonné “GG” Sogbossi took flight from Togo to America, he spoke only a little English. A native French speaker, Sogbossi, 22, began taking English as a second language classes at Tidewater Community College. He mastered the subject and will earn an Associate of Science in Engineering at TCC’s 65th Commencement Exercises on Dec. 18 at the Ted Constant Convocation Center. Sogbossi said TCC became like family to him, noting the dedication of many staffers. His favorite elective was American history because he liked seeing America from an insider’s perspective. Sogbossi, who graduates with a 3.4 GPA, participated in Gear Up To Lead, an engagement and leadership development program at TCC’s Chesapeake Campus. “Being part of Gear Up pushed me and helped me realize what I am capable of accomplishing,” he said. While Sogbossi misses his family, including four brothers and two sisters, he has connected with friends on campus to form a community. 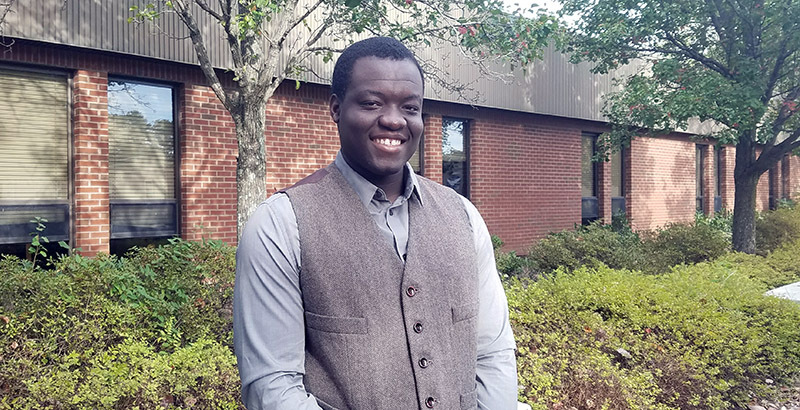 A part-time staffer at the Chesapeake Campus Student Center, Sogbossi appreciates the job because it allows him to earn money for living expenses. As an international student, working at the college is his only option. He hopes more doors of opportunity for work will open with his graduation. He is inspired by Amazon and would one day like to own his own diversified company. Sogbossi plans to transfer to Old Dominion University or Virginia Commonwealth University to earn his bachelor’s in engineering.